Bus stop and school zone safety is a major safety concern for us. Please have your child at their bus stop 10 minutes early and have them conduct themselves with appropriate school behavior. Inappropriate behavior can result in removal of riding privileges. It is extremely important that an adult be at the stop to meet small children when they are dropped off. Please don’t park in designated school bus zones at your child’s school. These zones are set up to keep our children safe. Illegally parked cars are serious safety concerns for our drivers. In the event your child misses their bus, please don’t chase the bus down and have your child run up to the bus. Their driver isn’t expecting them and you are putting your children at a serious risk. Your child’s safety is our #1 concern. Sandusky City Schools has 25 bus routes. 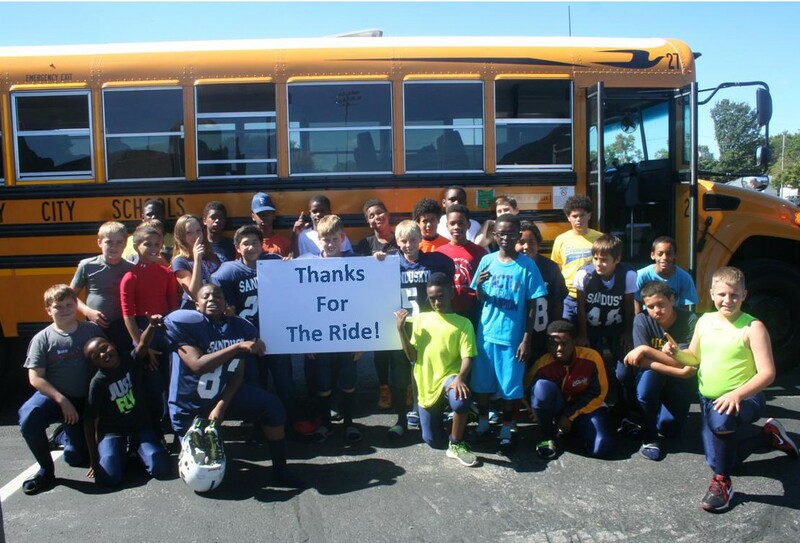 Each route has multiple route segments or schools that they serve. The total segments are 107. The drivers have over 400 years of combined experience or an average of 16 years per driver. Each day our routes travel a distance equivalent to a trip from Sandusky to Miami, Florida. Our busses cross 93 railroad crossings a day in our city alone. Please remind your children the importance on silence at all railroad crossings. Our drivers are trained and certified extensively by our trainers and the Ohio Department of Education. They must re-certify every 6 years.